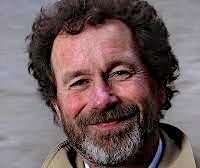 NOTE: Per Petterson was WINNER of the IMPAC Dublin Literary Award in 2007 for Out Stealing Horses, WINNER of the Nordic Council Literature Prize in 2009, and WINNER of many other prizes for his work. 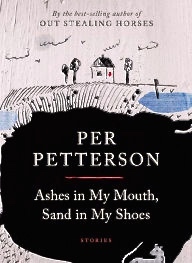 Norwegian author Per Petterson dedicates the ten short stories of Ashes in My Mouth, Sand in My Shoes (1987) to his own father in his first published book, creating a lovely and loving portrait of a father, his young son, and a few other members of their family as they go about their everyday lives in 1960s Norway Main character Arvid, who will go on to star in some later books by Petterson, is six years old in the collection’s opening story, growing to the age of ten by its conclusion, a hypersensitive child who notices and cares about the family around him even as he is also aware of how much he depends on them. Arvid’s unique point of view, his life, and his reactions to events in these stories, though perhaps more emotional than what most other children his age experience, are nevertheless so plausible and filled with heart that one cannot help believing that many of the happenings here were real and that the stories are somewhat autobiographical. 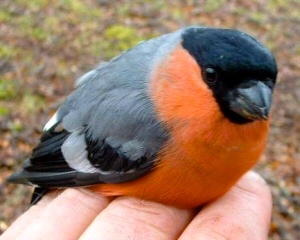 Seeming to breathe on their own, they need very little exposition to work their magic and draw in the reader, to whom they feel somehow familiar, no matter how the time, setting, and action may differ from our own. With the reader sharing the early life of an especially observant child, the author chooses his details carefully and writes in an especially concise style, with no wordiness to slow down the action, no grand statements, and, ultimately no need to explain the action or embellish it. The opening story sets the tone, as Arvid learns that his father has lost his job as foreman of a shoe factory and must soon take a succession of lesser jobs in places as far away as Denmark, for six months, in order to stay employed in the declining shoe business, which he loves. As the story develops, the action also shows the tense relationship between Arvid’s father and his brother Rolf, and eventually his father’s humiliation when he finally does obtain another job in another field of work. Arvid, at age six, understands his father’s situation primarily through the parallels he sees on a TV program, but Arvid’s own lack of enthusiasm for his father’s new, much more mundane job adds to his father’s sense of failure. In a mere ten pages, Petterson conveys much about the family’s dynamics, his father’s sense of pride, and, most importantly, Arvid’s own identification with his father. 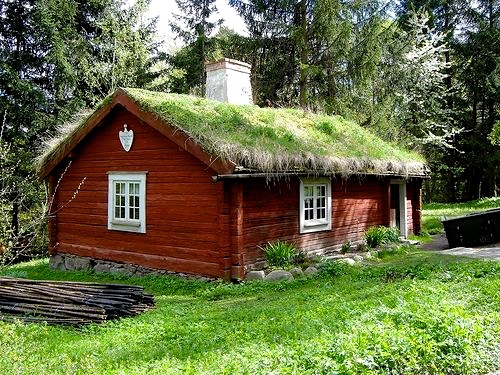 Arvid’s father and Uncle Rolf inherited their father’s red log cabin on the Bunne Fjord, a place where the father encouraged Arvid to become more assertive. 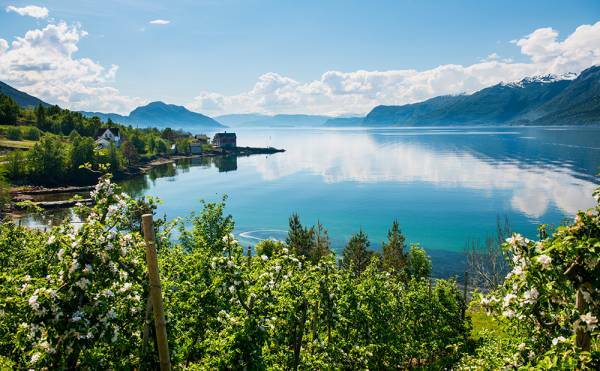 Norwegian fjord photo by Sverre Hjornevik, perhaps similar to the Bunne Fjord, where Arvid’s family has a red log cabin. His relationship with the outside world is seen in his confrontation with an adult next-door neighbor known as “Fatso” who uses Arvid and then reveals his own weaknesses in a dramatic ending which leads Arvid to avoid him forever afterward. Mocked for his innocence by other students when he is eight, Arvid reacts emotionally in “People are Not Animals” when the older boys try to joke about sexual mechanics with him, and he eventually decides how he will avoid such issues in the future. “Today You Must Pray to God,” a statement made by Arvid’s teacher to Arvid’s class at the time that she also announces that “Today there may be nuclear war,” introduces some of the world tensions of the day and leads to serious concerns for Arvid’s emotional health, while “Before the War,” the last story in the collection, shares his father’s experiences during World War II and his father’s efforts to toughen Arvid up at the vacation cabin that his father and Uncle Rolf jointly own. Arvid’s sudden awareness of what is important in life is a fitting conclusion to the novel. Arranged chronologically to give a sense of their interconnections from beginning to end, Petterson’s stories contain both dramatic action and psychological acuity. One of the most unusual aspects of the book occurs in the sudden endings to many of the stories. One reviewer complained about this, noting that many of these stories “just end,” instead of having a recognizable finale to give a few clues to the author’s purpose in writing them. Sometimes lacking the obvious thematic statements which so often accompany conclusions of stories by other writers, these stories with their well drawn, innocent point of view seem to operate on a different level, drawing a reader into Arvid’s life through his stories and providing some symbols to inspire the reader’s own memories and feelings – an experience that for me made them fun to read and enlightening, too; simultaneously casual and realistic in tone and style; both unpretentious and highly literary; and both unique and seemingly familiar. Here there is no need for ponderous statements – Arvid’s experiences are enough. A very small book, with very short stories, Ashes in My Mouth, Sand in My Shoes carries a disproportionately large impact, a debut which clearly presages the enormous success this author would eventually have in the literary world.